The Japanese government under Prime Minister Shinzo Abe is focused on the modernization of the armed forces. This is based on the changing geopolitical landscape and having various territorial disputes with several regional nations in Northeast Asia. 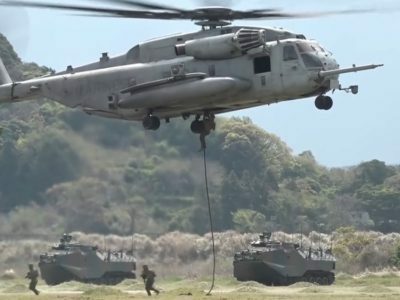 Hence, with China increasingly showing its military might, that equally threatens to encroach on territory belonging to Japan in outlying areas, then the first Amphibious Rapid Deployment Brigade (ARDB) formed earlier this year is aimed at boosting the defense of Japan. In time, the ARDB will develop into a force that comprises 3,000-members. Other military developments to boost the ARDB applies to utilizing the V-22 Osprey and Amphibious Assault Vehicles-7.